When I was ten years old, I made the executive decision to run away from home. There just way too many rules and regulations at my house for my taste. After sneaking out the back door in broad daylight, I ran to my best friend’s house. I tried to run away...next door. I snuck in through their back door and tiptoed down to their basement where I planned to live out the rest of my days in hiding. I would no longer be repressed by my parents’ constant nagging. What a perfect plan. Unlike my own dark and dismal basement that always seemed to be as humid as a Virginia summer day at high noon (not to mention the always present mildewy odor), my friend’s house had a finished and luxurious basement. Whereas my basement was littered with old, broken lawn furniture and used paint cans, this wonderful Shangri-la was furnished to the hilt. The furniture, the smell, the lighting, oh my! The carpet was soft and the awesome bean bags that lived in this awesome room were even softer. These bean bag chairs were placed ever-so-perfectly in a crescent formation around a huge television. And organized in alphabetical order, housed in rows on a wooden bookcase, was the best library of video games I had ever seen. I understood at that moment that I had been deprived for the ten years I had been on this Earth. My family didn’t have this underground place of amusement and comfort, where video games and bean bags worked together to create a little kid’s dream-come-true. At any rate, I arranged five bean bags into a fort of sorts, and placed the 6th one in the middle. This 6th one was my favorite. 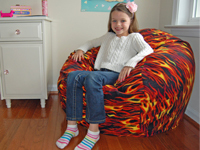 When I first laid my eyes on the super soft black fleece cover with red, yellow, and orange flames all over it, I fell in love… yes, folks, I was ten years old and I knew my heart was taken… by a bean bag chair! I plopped down on this amazing blob of comfort and told myself: I will never get hungry, I will never get thirsty, I will never get too cold, I will never get too hot, I will never need to go to the bathroom, and no one will ever take me away from all this. NEVER! Of course, none of this worked out as planned. I fell asleep, and shortly after dozing off, my friend’s Mom found me and called my Mom. That was the end of my attempt to run away. I was hungry, thirsty, and needed to go the the bathroom anyway! Later, I found out that my favorite bean bag is called Hot Rod fleece, and is one of Ahh! Products’ most popular styles. I can see why. In fact, I have one of my very own now! I never tried to run away again, but I made it a point to go over to my friend’s house as much whenever I could get a chance. I was able to convince my parents to upgrade our basement a little bit, but it was never as awesome as my friend’s. Maybe in a few years, when I have a child, I can finally create that Shangri-la again for my family – and hopefully the bean bags and video games will keep my kid from running away! Thanks to my friend Samantha for this cute story. Do you have any funny stories about trying to run away when you were a kid? Any fond memories of bean bag chairs? Please do share, I’d love to hear your stories!